The Astros announced today that righty Joe Smith has undergone surgery for a ruptured Achilles tendon in his left leg. (H/t Chandler Rome of the Houston Chronicle, via Twitter.) It will sideline him for an estimated six-to-eight month stretch, putting a large chunk of his 2019 season in jeopardy. Needless to say, that’s most unwelcome news for both player and team. Smith, 34, is said to have suffered the injury in a recent workout. The 34-year-old is slated to earn $8MM for the 2019 campaign, his second in Houston since signing a two-year deal last winter. Smith, a crafty sidearmer who has held opposing right-handed batters to an anemic .215/.280/.311 batting line over his dozen MLB campaigns, would surely have been a part of the ’Stros pen again in 2019. Last year, he worked to a 3.74 ERA with 9.1 K/9 and 2.4 BB/9. He was tough to square up, as usual, but did allow nearly 1.4 homers per nine — about twice his career average. Of course, it’s only fair to note that the organization will have a bevy of alternatives, particularly if it makes some rotation additions that bump other players into relief contention. Smith, in fact, was not much of a factor in the club’s postseason mix, cracking the roster but making just one appearance (which did not go well). Still, he’s a quality veteran performer and it always hurts to carry a salary commitment that doesn’t provide production. The Astros will have to hope that Smith is able to recover relatively quickly and provide a mid-season boost. Mariners lefty James Paxton is slated to make his final start of the season Saturday, and he’ll be on a pitch count of about 85, tweets Ryan Divish of the Seattle Times. Paxton is aiming to top 160 innings in an effort to build up to the point where he’d be able to strive for a 200-inning season without any workload limitations. Paxton, 30 in November, has never approached that mark in any professional season, topping out at a combined 171 2/3 innings between Triple-A and the Majors in 2016. He’s battled everything from a lat strain, to a forearm strain, back inflammation and a severe tendon injury in his pitching hand over the course of an impressive but injury-laden career to date. Seattle has control of Paxton through the 2020 season and will certainly be hoping for a larger workload and better health next season, given the deterioration of previous ace Felix Hernandez. Thus far in 2018, Paxton has pitched a career-high 154 1/3 innings with a career-best 11.6 K/9 mark against just 2.5 BB/9. He’s been more homer-prone than in recent years (1.34 HR/9) but still owns a solid 3.85 ERA that is backed by career-best marks in fielding-independent marks like xFIP (3.08) and SIERA (3.01). The Angels shut down right-hander Ty Buttrey for the remainder of the season this week, as the promising 25-year-old has been dealing with a bout of bursitis in his right knee, per MLB.com’s Maria Guardado (Twitter links). Buttrey’s ascension to the big leagues didn’t draw many headlines, but he’s quietly been sensational both in the upper minors and in 16 1/3 innings for the Angels since being acquired from the Red Sox in the trade that sent Ian Kinsler to Boston. Buttrey pitched to a combined 2.20 ERA with 13.6 K/9 against 2.8 BB/9 with three different minor league affiliates this season, and he’s sporting a 3.31 ERA with an outstanding 20-to-5 K/BB ratio and a 56.8 percent ground-ball rate in the Majors. He’s averaged a hearty 96 mph on his heater thus far in his young Major League career, and so long as his knee issues don’t prove to be especially serious, he should have an opportunity to earn his way into high-leverage spots with the Halos early next season; he did, after all, tally four saves with the Angels shortly after his MLB debut. Small sample caveats clearly apply, but the Angels have to be pleased with the early returns on that swap. The Athletic’s Jake Kaplan takes a look at six questions facing the Astros as the gear up for the American League Division Series against the Indians, including a pair of questions they’ll face in setting their roster (subscription link). If Lance McCullers Jr. is ready to go as a piece in the bullpen, Houston brass will have to decide between a hard-throwing multi-inning option, Josh James, and Joe Smith, a seasoned veteran who could be a matchup specialist against Cleveland sluggers like Edwin Encarnacion and Josh Donaldson. The ’Stros also need to weigh whether Max Stassi should be carried as a third catcher, thus freeing up more pinch-hitting opportunities, or if Myles Straw and his blazing speed should command the final bench spot. The Giants placed reliever Cory Gearrin on outright waivers last week, Ken Rosenthal of FOX Sports reports (video link). No one claimed Gearrin, however, and he remains a member of the Giants. The luxury-tax threshold helped influence the decision to waive Gearrin, per Rosenthal, who points out that San Francisco is $2MM-plus above the $197MM figure. Had someone taken Gearrin off the Giants’ hands, it would have saved the team upward of $1MM and helped give it more flexibility as the July 31 non-waiver trade deadline approaches. It’s no surprise the 32-year-old Gearrin went unclaimed, though, given that he has recorded a 5.11 ERA over 24 2/3 innings with unappealing walk, groundball and home run rates (4.74 BB/9, 34.2 GB percentage, 1.82 HR/9). The Rangers announced that they’ve placed right-hander Doug Fister on the disabled list, retroactive to Saturday, and recalled infielder Hanser Alberto from Triple-A. It’s the second DL stint of the year for Fister, who’s dealing with a right knee strain. He previously missed time in April with a right hip strain. Thanks in part to his injury issues, it hasn’t been a particularly good season for the 34-year-old Fister, whom the Rangers added on a $4MM guarantee in free agency. Despite a 50.4 percent groundball mark and a low walk rate (2.59 per nine), Fister has logged 4.50 ERA/5.19 FIP over 66 innings and 12 starts. Given that Texas won’t be in contention around the deadline, the team could market the veteran if he’s healthy, though it seems unlikely he’ll have much of any value. The Astros have placed reliever Joe Smith on the DL and recalled lefty Reymin Guduan from Triple-A, Jake Kaplan of The Athletic tweets. Smith’s battling “elbow discomfort,” which obviously isn’t the most reassuring ailment for a pitcher. Like Fister, Smith inked a free-agent contract over the winter and has endured a down season. The recipient of a two-year, $15MM pact, the normally solid Smith has put up a 5.49 ERA in 19 2/3 innings, but he has managed quality strikeout, walk and grounder rates (9.15 K/9, 3.2 BB/9, 49.0 GB percentage). 4:36pm: Smith will earn $7MM in 2018 and $8MM in 2019, FanRag Sports’ Jon Heyman tweets. 6:20am: Ken Rosenthal of The Athletic reports that the two-year deal actually guarantees Smith $15MM. THURSDAY, 2:32am: Bob Nightengale of USA Today Sports reports that Smith will be paid $14MM over his two-year pact (Twitter link). WEDNESDAY, 8:18pm: Smith passed a physical in Houston on Wednesday, Kaplan tweets, and the team has announced the agreement. Financial details aren’t yet available. 5:13pm: The Astros have agreed to a deal with free agent reliever Joe Smith, pending a physical, Brian McTaggart of MLB.com tweets. It’s a two-year pact, per Jake Kaplan of the Houston Chronicle (Twitter link). Smith is a client of Excel Sports Management. Houston will be the sixth team for the 33-year-old Smith, who has served as a more-than-capable reliever since making his major league debut in 2007. The sidearming, soft-tossing right-hander has racked up a combined 624 2/3 innings of 2.97 ERA pitching and posted a 55.7 percent groundball rate with the Mets, Indians, Angels, Cubs and Blue Jays. While Smith’s success has come in spite of modest strikeout and walk rates (7.88 K/9, 3.17 BB/9), he found another gear in both departments last season. Across 54 innings divided between Toronto and Cleveland, Smith logged 11.83 K/9 against 1.67 BB/9 and recorded an 11.4 percent swinging-strike rate – a vast improvement over his lifetime mark of 8.4. He joins Bryan Shaw, now with the Rockies, as the second proven reliever to depart the Indians via free agency this winter. While the World Series-contending Indians have seen their bullpen weaken since last season ended, Smith should step in with aplomb for Luke Gregerson, who left the reigning champion Astros for the Cardinals. Along with Smith, Houston has a host of other quality pieces in the fold in Ken Giles, Chris Devenski, Will Harris, Joe Musgrove and, if he doesn’t start, Brad Peacock, with Michael Feliz and James Hoyt also in the mix. All of those hurlers are righties, which could lead the Astros to reel in a southpaw at some point this winter, though their relievers did limit lefty-swingers to a .231/.306/.395 line last season. Smith, meanwhile, has typically been effective against lefties, having held them to a .242/.336/.369 mark during his career. Though the free agent market has basically not yet budged, that doesn’t mean there hasn’t been movement behind the scenes. The Mets, for instance, are working hard to land multiple veteran relievers, according to Mike Puma of the New York Post. There’s particular interest, Puma writes (expanding upon his prior report), in veteran righty Bryan Shaw. The durable veteran worked with new Mets manager Mickey Callaway, who was previously the Indians’ pitching coach. That fact clearly gives the organization some added insight into a hurler who has steadily produced excellent results. Another pitcher with a recent connection to Callaway has also caught the Mets’ eye, according to the report. Sidearmer Joe Smith, who broke into the big leagues with the Mets, is closing in on his 34th birthday but has a track record of consistently good innings that’s similar to Shaw’s. Interestingly, Smith exhibited a big jump in his swinging-strike rate (11.4%) and strikeout rate (11.8 K/9, against just 1.7 BB/9) in 2017. Two others on the Mets’ watch list, according to the report, are lefty Mike Minor and former Mets righty Addison Reed. Both of those pitchers are in the same general range of sub-elite relievers as Shaw, though MLBTR has predicted that each would be able to secure an extra guaranteed season on the open market. It seems unlikely that the Mets would be able to take on two significant relief contracts in one winter, so perhaps the hope is to land one of those three (or another, similar pitcher) while also picking up a slightly cheaper option such as Smith — who just missed inclusion on MLBTR’s top fifty list but could certainly be a candidate for a significant, multi-year deal. It’ll be interesting to see whether the Mets are able to strike an early deal with one of these pitchers. There’s surely broad interest in all of them, and getting something done now — before more significant dominoes fall — could mean extending an offer that meets or approaches the typically steep initial asking price. To take but one example, the Cardinals landed Brett Cecil last winter by giving him a fourth year and a no-trade clause, neither of which were anticipated when the market opened. The Cardinals are more likely to trade for an impact bat than sign one, suggests Derrick Goold of the St. Louis Post-Dispatch. Peter Gammons of GammonsDaily.com reported Saturday that the Cardinals are willing to offer “one of their best young pitchers” for Marlins right fielder Giancarlo Stanton, and Goold adds that the Redbirds will have discussions with Miami about both Stanton and center fielder Christian Yelich this offseason. Former Rangers ace and soon-to-be free agent Yu Darvish is not atop their offseason wish list, Jeff Wilson of the Star-Telegram reports. The Rangers will contact Darvish’s agent during free agency, but the likelihood is that he’ll be too pricey to return to the team, per Wilson. With a Darvish reunion looking like a long shot, the Rangers might turn to another established free agent right-hander in Alex Cobb, whom they covet, according to Wilson. The longtime Ray, 30, returned from a 2015 Tommy John procedure in earnest this year, tossing 179 1/3 innings of 3.66 ERA/4.16 FIP ball. The Indians aren’t optimistic that they’ll be able to re-sign impending free agent reliever Bryan Shaw, Paul Hoynes of cleveland.com reports. 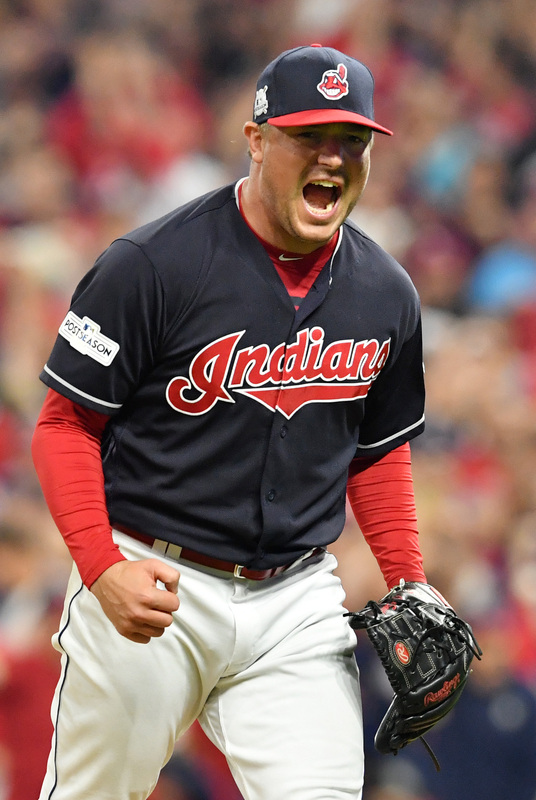 Shaw has been an effective workhorse out of the Indians’ bullpen since 2013, having pitched to a 3.11 ERA across 358 2/3 innings during that five-year span, and appears poised to parlay his success in Cleveland into a contract out of the club’s price range. MLBTR projects a three-year, $21MM deal for Shaw, which the Indians believe will prove close to accurate, Terry Pluto of cleveland.com writes. With the soon-to-be 30-year-old Shaw apparently on his way out, the Tribe could feel more urgency to re-sign fellow impending free agent reliever Joe Smith, Hoynes notes. Smith, who will play his age-34 season in 2018, is fresh off a terrific campaign divided between Toronto and Cleveland. It was just under a decade ago that Mickey Callaway agreed to become the interim head coach for Texas A&M International University, which sparked his interest in teaching and training young players. Though Callaway pitched in Taiwan and in independent baseball in 2008, that was his final season as a player, as Callaway tells Newsday’s Marc Carig that “It was hard to concentrate on playing after feeling that I was ready to start coaching.” Carig’s profile of Callaway’s first time running a team is well worth a read, providing insight into the man who has become a big league manager for the first time after being hired by the Mets. As we enjoy a wild Game Five of the World Series, here’s more from around baseball…. The Indians seem prepared to spend in the short-term to keep their window of contention open, Terry Pluto of the Cleveland Plain Dealer opines during his look at the some of the Tribe’s free agents this winter. Pluto figures Carlos Santana will be issued a qualifying offer, and the team will monitor the markets of Santana and Jay Bruce to see if either could be re-signed for a reasonable amount, a la how several other veteran sluggers received smaller-than-expected deals last winter (which allowed the Tribe to sign Edwin Encarnacion). As for other decisions, Pluto thinks Bryan Shaw and Boone Logan will both be pitching elsewhere in 2018, while Joe Smith seems the likeliest of the relievers to return to Cleveland. Josh Tomlin’s $3MM club option seems like a good bet to be exercised by the team. Also from Pluto, newly-hired pitching coach Carl Willis said two other teams had made him job offers and two others showed interest in his services. With this kind of interest, the Indians had to jump to sign the veteran pitching coach just a few days after ex-pitching coach Mickey Callaway left for the Mets. Mets hitting coach Kevin Long has been mentioned as a candidate for the Yankees’ managerial job, though he may also be a contender to be the Yankees’ next hitting coach, George A. King III of the New York Post writes. Long previously served as the Bronx Bombers’ hitting coach from 2007-14 before moving over to his post across town with the Mets. Alan Cockrell has been the Yankees’ hitting coach for the last two years, though with a new manager coming, there are likely to be changes made to the Yankees’ coaching staff. With the offseason looming, it’s easy to focus on the top free agents this winter will have to offer. We at MLBTR reinforce that line of thinking with monthly Free Agent Power Rankings that profile the top names slated to hit the open market and ranking them in terms of earning power. Kurt Suzuki, $1.5MM, Braves: Suzuki languished in free agency for several months as players like Jason Castro, Matt Wieters and Welington Castillo all generated more attention from teams and fans. However, it might be Suzuki that has provided the most bang for buck on last winter’s catching market. The 33-year-old has had a surprising career year in Atlanta, hitting .266/.344/.507 with 15 homers to date. Some have been quick to suggest that Atlanta’s new homer-happy stadium has benefited Suzuki, and while that may be true to an extent, he’s hit for more power on the road than at home. He’s put himself in position for a possible two-year deal this winter, but if he has to settle for one yet again, it should come at a higher rate. Adam Lind, $1.5MM, Nationals: An awful 2016 season and an overcrowded market for corner bats created some questions about whether Lind would have to settle for a minor league contract late last winter. He ultimately secured a guaranteed deal, but it came with just a $1MM base and a $500K buyout of a mutual option. For that meager commitment, he’s given the Nats 267 plate appearances with a .297/.352/.490 slash to go along with 11 homers. Like Suzuki, that might not land him a starting role, but it could land him multiple years as a complementary bench piece. Chris Iannetta, $1.5MM, Diamondbacks: Iannetta has not only rediscovered his power stroke in 2017 — he’s made it better than ever. The 34-year-old’s .249 ISO is a career best, and he’s slugged 14 homers. While that’s still four shy of his career-best with the 2008 Rockies, Iannetta’s 14 big flies this year have come in just 272 PAs, whereas he needed 407 to reach 18 back in ’08. He’s also bounced back from a down year in the framing department and been above average in that regard, per Baseball Prospectus. Jhoulys Chacin and Clayton Richard, $1.75MM each, Padres: The Friars signed four starters for $3MM or less last winter — Jered Weaver and Trevor Cahill being the others — and have received a combined 345 innings out of this pair. Chacin’s run-prevention (4.06 ERA) and strikeout rate (7.44 K/9) have been better, while Richard has 13 more innings (179 total), superior control (2.6 BB/9) and superior ground-ball tendencies (59.1 percent). Neither is going to be mistaken for much more than a back-of-the-rotation stabilizer, but both have done enough to garner larger commitments on the upcoming open market. Brian Duensing, $2MM, Cubs: I doubt I was alone in being surprised to see Duensing, 34, land a Major League deal last winter on the heels of a lackluster season in the Orioles organization. Duensing, though, has quietly been outstanding for the Cubs. In 54 2/3 innings, he’s logged a career-high 9.05 K/9 rate with 2.30 BB/9 and a 47 percent ground-ball rate en route to a 2.63 ERA. He’s held lefties in check reasonably well, but the first time in his career he’s also striking out right-handed batters at a lofty rate. In fact, the .211/.276/.317 that righties have posted against him is actually weaker than the .256/.300/.388 slash to which he’s limited left-handed bats. Matt Belisle, $2.05MM, Twins: Belisle’s inclusion is arguable; he’s posted a pedestrian 4.36 ERA with 8.55 K/9, 3.69 BB/9 and a 42.2 percent ground-ball rate. Those numbers are largely skewed by a putrid month of May, however. Since June 3, Belisle has a 2.25 ERA with nearly a strikeout per inning and improved control and ground-ball tendencies — all while stepping into higher and higher leverage roles. He’s now serving as the Twins’ closer and has a 1.54 ERA with a 29-to-5 K/BB ratio since July 1. He’ll be 38 next season, so the earning power here isn’t sky-high, but he’s probably earned a raise, barring a late collapse. Logan Morrison, $2.5MM, Rays: Few players have benefited more from one-year, “pillow” contracts in recent memory than Morrison, who has parlayed his $2.5MM deal into a .248/.355/.529 batting line and a 36-homer season campaign to date. Morrison only just turned 30 years old, so he’ll have age on his side this winter as well. A three- or four-year deal seems plausible for Morrison even with the diminished recent market for corner bats. Alex Avila, $2.5MM, Tigers: Avila hasn’t been as excellent with the Cubs as he was with the Tigers, but he’s still among the league leaders in hard contact and exit velocity — both of which have beautifully complemented his always-terrific walk rate (15.9 percent in 2016). With 14 homers under his belt and a batting line that grades out roughly 25 percent better than the league average, per context-neutral metrics like OPS+ (124) and wRC+ (127), Avila could vie for a multi-year deal and/or a starting job this offseason. Joe Smith, $3MM, Blue Jays: Smith’s K/9 has nearly doubled, from 6.92 in 2016 to 11.86 in 2017, and he’s posted a dramatically improved 1.82 BB/9 this year as well. Smith has also served up just three homers in 49 1/3 innings of work, and his 3.10 ERA, while solid, is actually representative of some poor fortune in the estimation of fielding-independent metrics (1.97 FIP, 2.35 xFIP, 2.34 SIERA). He’ll be 34 next year but should top that $3MM mark and could net the second multi-year free-agent deal of his career. Andrew Cashner, $10MM, Rangers: MLBTR’s Jeff Todd recently took a more in-depth look at Cashner, noting that his strong 3.19 ERA isn’t backed up by his K/BB numbers. Cashner’s complete lack of missed bats — he has the lowest swinging-strike rate and second-lowest K/9 rate of qualified MLB starters — is going to limit his earning power. But, he’s undeniably been better than he was in 2016, his velocity is comparable to last season and he’s limited hard contact quite well. A multi-year deal is certainly a possibility this offseason. Carlos Gomez, $11.5MM, Rangers: Gomez’s production hasn’t reached the star levels it did in 2013-14, but he’s been a better performer at the plate this season. A spike in his OBP (from .298 to .337) is due largely to a massive increase in the number of pitches by which he’s been hit, which is less encouraging than if he’d upped his walk rate considerably. However, Gomez has also shown quite a bit more power in 2017 than he had in recent seasons (.208 ISO in ’17 vs. .153 in ’15-16 combined), and Defensive Runs Saved feels he’s improved in center field as well. Gomez won’t see the massive payday he looked to be on pace for after 2014, but he’s still young enough to notch a multi-year deal this winter. Notable exceptions: Neither Welington Castillo nor Greg Holland is included on this list, though both have provided good value to their new teams (Castillo in particular). While their contracts are often referred to as one-year deals with a player option, that type of contract is no more a one-year deal than Jason Heyward’s eight-year, $184MM deal with a third-year opt-out is a three-year deal. Both players were guaranteed the possibility to be under contract for two years, and those agreements are considered two-year deals for the purposes of this list. Jerry Blevins has also given the Mets terrific value on his one-year, $6.5MM deal, but the club option attached to that deal is a veritable lock to be exercised, so he’s unlikely to hit the free-agent market again following the season. The Indians have acquired right-hander Joe Smith from the Blue Jays, The side-arming reliever, a free agent at season’s end, will return to Cleveland for his second stint with the Indians. Minor league lefty Thomas Pannone and shortstop Samad Taylor are going to the Jays to complete the deal. Righty Perci Garner has been designated for assignment by the Tribe to make roster space for Smith. The 33-year-old Smith enjoyed five excellent seasons in Cleveland, pitching to a 2.76 ERA in 271 innings there from 2009-13. Since that time, he’s produced quality results in both Anaheim and in Toronto, although his 2017 campaign has been slowed by a roughly month-long stay on the disabled list due to inflammation in his right shoulder. That said, Smith has been outstanding, when healthy, thus far in 2017. Through 35 2/3 innings, he’s averaged 12.9 K/9 against 2.5 BB/9 with a 43.2 percent ground-ball rate. The resulting 3.28 ERA looks solid in its own right but is buoyed by even more impressive FIP (2.31), xFIP (2.46) and SIERA (2.42) marks — suggesting that there’s yet room for improvement down the stretch. Smith is earning a modest $3MM in 2017, and he’s owed the balance of that figure — roughly $1.03MM — through the end of the year. In the interim, he’ll slot into a formidable Indians relief corps that is anchored by Andrew Miller and Cody Allen but also features a number of strong right-handed options, including Zach McAllister, Nick Goody, Dan Otero and Bryan Shaw. MLB Network’s Ken Rosenthal (on Twitter) reported the trade. Paul Hoynes of the Cleveland Plain Dealer tweeted the return after Tim Brown of Yahoo Sports reports (on Twitter) that it involved two lower-level minor leaguers.